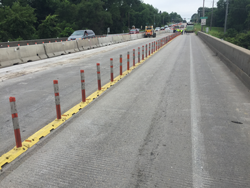 Use of bridge deck overlays is important in maximizing bridge service life. Overlays can replace the deteriorated part of the deck, thus extending the bridge life. Even though overlay construction avoids the construction of a whole new bridge deck, construction still takes significant time in re-opening the bridge to traffic. Current processes and practices are time-consuming and multiple opportunities may exist to reduce overall construction time by modifying construction requirements and/or materials utilized. Reducing the construction time could have an effect on reducing the socioeconomic costs associated with bridge deck rehabilitation and the inconvenience caused to travelers. This work included three major tasks with literature review, field investigation, and laboratory testing. Overlay concrete mix used for present construction takes long curing hours and therefore an investigation was carried out to find fast-curing concrete mixes that could reduce construction time. Several fast-cuing concrete mixes were found and suggested for further evaluation. An on-going overlay construction project was observed and documented. Through these observations, several opportunities were suggested where small modifications in the process could lead to significant time savings. With current standards of the removal depth of substrate concrete in Iowa, it takes long hours for the removal process. 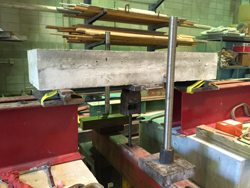 Four different laboratory tests were performed with different loading conditions to determine the necessary substrate concrete removal depth for a proper bond between the substrate concrete and the new overlay concrete. Several parameters, such as failure load, bond stress, and stiffness, were compared for four different concrete removal depths. Through the results and observations of this investigation several conclusions were made which could reduce bridge deck overlay construction time.